‘Raksha Bandhan’ or ‘Rakhi’ is the Indian festival of celebrating the lovely, chaste bond between a brother and a sister. On this auspicious day the sister ties her brother a sacred thread around the wrist and prays for his long life. Rakhis are ideally made of silk with gold and silver threads, beautifully crafted embroidered sequins, and studded with semi precious stones. But this one here is for all those sisters who love pampering their brothers with the best of all. This elegant Rakhi boasts of a real diamond which can also be used as a pendant by removing its thread. The special Rakhi comes in a fancy box hamper that also contains 200 grams of Kaju Katli sweet. The 14kt. gold Rakhi will definitely make your brother realize how special he is for you. And maybe, if you are lucky enough he gives you a diamond ring in return of this Diamond Rakhi. 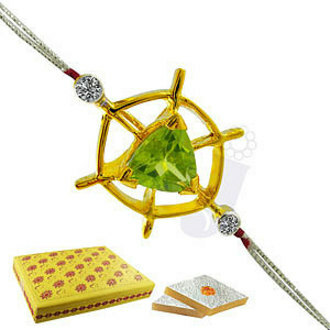 The Jagdamba twinkling star diamond Rakhi comes for $60 and its available here.